You can learn here how to switch firmware for the Lego Mindstorms NXT. If your NXT has leJOS (Java) firmware and you want to switch to Lego, read the first section. For the other way around: to switch from leJOS to Lego, read the second section ‘Install leJos firmware’. This article ends with a section ‘Troubleshooting’ in case you have an non-functioning NXT. 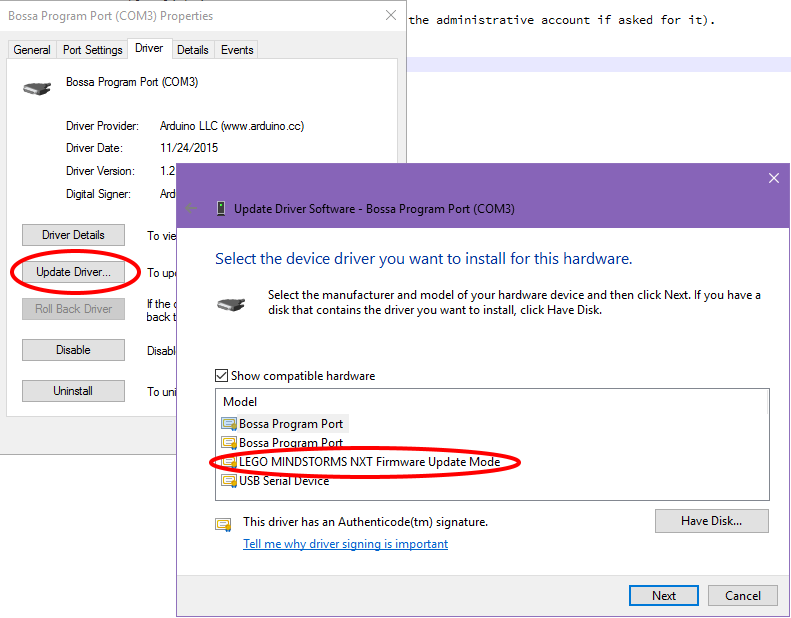 How to see which firmware is installed? If you turn on the NXT and you see the Lego-logo followed my the text ‘MINDSTORMS’, you have the Lego Mindstorms firmware. Prerequisites: you should have the Lego Mindstorms NXT software installed. If an older version is listed, you can use the Browse button to find the newer version of the firmware. I recommend to use version 1.31 or later! If you take my course ‘Application Development’, you can find it in the folder “Lego\firmware\1.31” where you extracted the ZIP-file of this course. Otherwise you can find it on the Lego site. Finish by pressing the Download-button. The selected firmware will be installed. If after you pressed the Download-button, the Progress halts and your NXT makes a (soft) clicking sound, please continue to the Troubleshooting-section below. Prerequisites: you should have the leJOS software installed. Without Eclipse, you can Browse to the folder where leJOS is installed and start the tool: C:\Program Files (x86)\leJOS NXJ\bin\nxjflashg.bat (if it does not work check your Java environment). Start by pressing the button ‘Flash leJOS firmware’. 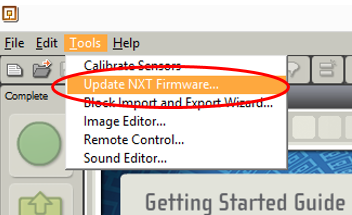 If when updating the firmware of the NXT you end up with a clicking NXT (click of death), here’s a possible fix. Leave the firmware update Window open. Do not disconnect the NXT. 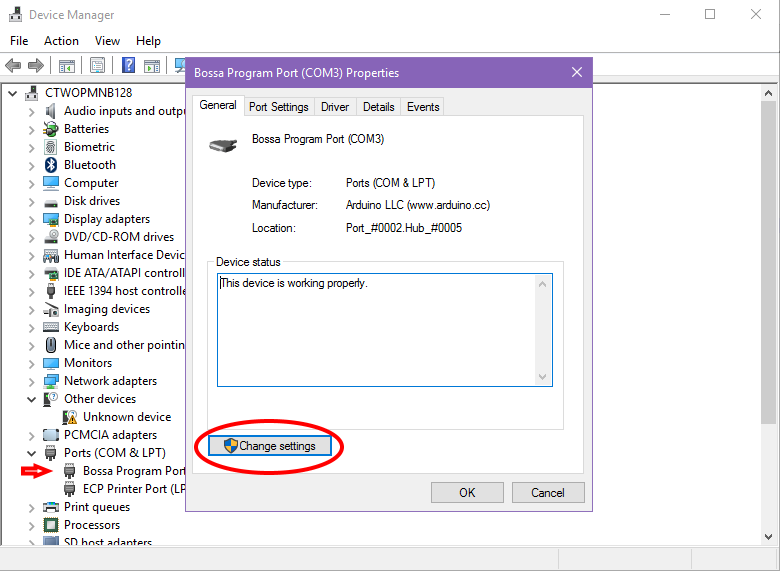 In Windows 8 or 10, type ‘Device’ in the search bar and start Devices, then click Device Manager. In other Windows versions find ‘Computer Management’ in the Start menu, then click Device Manager. Open the entry ‘Ports’ by double clicking it. If you see a ‘Bossa Program Port’. Double click it. Click the ‘Change settings’ button to gain administrative rights (enter a password of the administrative account if asked for it). Go to the tab ‘Driver’ and click ‘Update driver’. Choose ‘Browse my computer…’ and then ‘Let me pick…’. 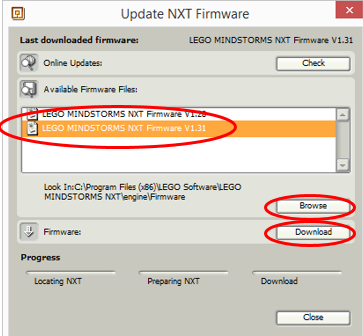 From the list, select ‘LEGO MINDSTORMS NXT Firmware Update Mode’ and click Next. The firmware update should complete automatically. Replace the battery by a fully charged one. Remove the battery and check its connectors. Locate the reset button, ‘hidden’ on the underside of the NXT, inside the peg hole directly under the USB connection port, as per the diagram below. Use an unwound paperclip to press down on the reset button for a full 20 seconds. You should be able to feel it get pressed down slightly. Repeat this, if you are unsure whether the end of the paperclip is actually pressing down on the reset button or it slips off the button.